Over/Under: Under 164.5 at 1.90 Bet Now! The hosts come into this game on the back of a win, so they will look to turn a solitary victory into a run of wins in this game. 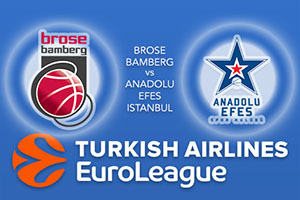 Brose Bamberg hold a 3-8 record while the Turkish side carry a 6-5 record at this point of the campaign. These teams have met four times in recent memory and the record stands at 2-2 so whoever takes control of this game will move ahead in the Euroleague records between these teams. Bamberg will be lifted with their win in Tel Aviv last week and they know they need to make the most of their home games. It has been a tough season so far but they do have a genuine class act in Nicolo Melli. Melli was the MVP in Round 11 of the Euroleague and he has grabbed an average of 13.8 points and 8.3 rebounds per game so far this season. The rebounds tally is currently the second best in the whole of the Euroleague. Other players of note for the German side this season have been Darius Miller, with an average of 13.4 points per game while Janis Strelnieks has provided an average of 11.5 points to this point. These are the players the home fans will be pinning their hopes on in this Thursday night Euroleague game. Efes are on a winning streak of three games and while they know this is likely to be a tough game, they will think that they can keep their run going. If the Turkish side is to grab a win, you can expect Derrick Brown to be at the heart of things. He has chipped in with an average of 12.9 points per game so far this season, while also offering an average of 6.5 rebounds and 3.0 assists so far this campaign. Thomas Heurtel has also been in fantastic form, offering an average of 12.7 points per game while providing an average of 5.7 assists per game. DeShaun Thomas has also been in good form, providing an average of 10.7 points per game this season. The Anadolu Efes offence is decent, scoring an average of 86 points per game at this stage of the season but they also give up an average of 86 points per game, so that balances out neatly! Take Anadolu Efes Istanbul at +3.5, at odds of 1.90 and for the Over/Under market, go UNDER 164.5 at odds of 1.90. Bet Now!